Chili rating - med - 2. Real Thai. Versatile, aromatic paste for curries, marinades, soups & stir-fry's. Gluten free. No artificial colours, flavourings or preservatives. No MSG. Suitable for vegetarians & vegans. 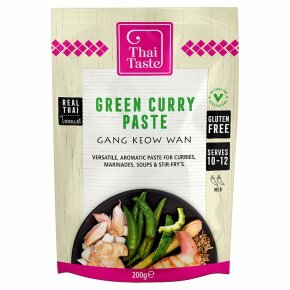 This highly versatile, aromatic paste adds depth-of-flavour to any dish, is wonderful for marinating, or can be mixed with coconut milk for the perfect fresh, tangy and aromatic Thai green curry - a superb classic Thai favourite! Ideal with any type of meat, fish or vegetable, this authentic paste is made in Thailand with fresh ingredients, including green chilli, lemongrass, black galangal and kaffir lime peel. Not suitable for microwave cooking.